My message to British Eurosceptic parliamentarians: "Those who despise the euro the most have the highest moral duty to help fix it!" Ladies and gentlemen, the world after 2008 cannot be made sense of in the language and by means of the narratives that preceded 2008. We are in uncharted territory now and we need to create a new discourse. Before 2008, we based our growth on what turned out to be a global Ponzi scheme; a global surplus recycling mechanism that was bound to buckle under its own hubris. Aided and abetted by what I term toxic economic theory (a particularly pernicious form of ideology), the US, Britain and the Eurozone were pretending to be living the dream of some Great Moderation – when the reality could not have been more immoderate. After 2008, Post-Credit Crunch, both Europe and Britain turned to Ponzi Austerity, pretending that growth will come when new debts are created on condition of more income-sapping, universal austerity – hoping to free-ride on growth that comes from America or Asia. Alas, it won’t happen. Europe cannot eschew its responsibility to help restore global growth. However, while designing the Recovery, we better beware: The return to growth should not come at any price. What grows matters. We want growth in sectors that generate good things that humanity needs more of and a deep deflation of the toxic sectors that make life nasty, brutish and short – from physical pollutants to real estate bubbles and toxic derivatives. We must aim at the mobilisation of idle savings into medium to long-term investments that serve genuine human needs – rather than producing new bubbles for the purpose of dealing with the ill effects of previous bubbles that burst disastrously. None of this will be accomplished by markets caught up in an equilibrium of fear that is reinforced daily by universal austerity. Equally, none of it will happen unless public investment takes markets seriously. Lastly, permit me to finish on a note appropriate to the great debates that take place in this fine building concerning this country’s role in Europe and with regard to your attitude to the Eurozone – to the currency union whose on-going disintegration is threatening to push us all into the mists of a long Winter of Global Discontent. Like many of you here tonight, who happen to share a Eurosceptic disposition, I too think that we Europeans created a monster in the form of the Eurozone. And just like Mary Shelley’s Dr Frankenstein, whose intentions were not all bad, we now find ourselves unable to control our creation, the euro – a vicious beast that is wrecking our neighbourhood with reckless abandon. But my message to my Eurosceptic friends, of both the Left and the Right, both here in Britain and in my own country, is this: Beware what you are wishing for. For the cruellest God is the one who grants us our wishes. We may wish that inane Euro-loyalists get their comeuppance; that they learn their lesson the hard way, watching their ill-conceived Euro perish. But, tragically, if this happens, the pain will spread far and wide and the vast majority of victims will be outside the Eurozone and will suffer far more than the Eurocrats ever will. If we fail to fix the Eurozone, Europe will most probably inflict, for the third time in a century, an unnecessary calamity upon humanity. My great fear, and conviction, is that, today, Europe’s worst enemies are the Euroloyalists who profess to serve and to believe in it. Not the Eurosceptics. Europe needs Eurosceptics, or better Eurocritics, to be at its centre. To stop deluding themselves that they can sit this one out. After all, no economy is an island. Monday 29th October, in the House of Parliament, London, debating "European and Global Recovery – What Will It Take?" Dear professor, your constant efforts and your good will are touching but since the world keeps moving in its current predetermined course you could find yourself completely out of touch with the sad reality. You talk of eurosceptics, eurocritics, euroloyalists. Well, what about the common factor among all three of these? What about Europe? Is it not obvious that this common ideal now means something completely different for all these three groups and the sad reality is that actually all possible outcomes of these groups whishes point to a dystopian future? Is the best future that we can hope for, the one that involves the least possible misery? No society can operate with an ideal like that. The public opinion is constantly focused on this never-ending debate about the economy while politically, socially, culturally in fact in every way that counts, European societies are slowly but surely heading for a modern version of the Dark Ages. The highest GDP growth numbers in the world are not enough to repair the damage that has been done to our society these past years since the outbreak of this crisis. Maybe it’s also high time to look past the economic troubles and the economic aspects of the policies that led us to this and turn a new page. We should be trying to find common ground in our society, try to build consensus in order to rebuild our institutions, our political and social fabric. I do not think that this can be done if we are constantly looking for salvation from a nonexistent European ideal. It is time to realize that our various hopes and dreams for a European Union of the people have been brutally crushed and try and do something about it. Yes, I fully agree with you and you should have added also it is time for Greece and others to leave this German dominated European Dis-Union once and forever! I think one of the first things that need to go in our society in any possible rebuilding process is our inexplicable tendency to interpret the world through conspiracy theories. It is the exact same thing as holding on to dreams and ideas that clearly are a thing of the past or so out of touch with reality it is almost painful to watch. To make my point more relevant and maybe personal, I believed in the aforementioned European ideal of an open pan-European society of the people, for the people and by the people in my important formative years and it was inspiring. Now I think it is a burden. It is a weight that drags us down. An empty shell. It is time to acknowledge reality. Admit defeat and move on. There is no shame in that I think. The world changes and it is time for us to change as well. Nice thought, but these Eurocrats don’t listen to what the member states say. They are above criticism, above democracy. We are nothing but “drones” who work, day in day out and then pay our tribute to the “EuroGods”. Who do you think is fighting our cause? The people, constantly nagging our politicians for a voice in this “Union”. We’ve been at this for YEARS! We do not intend to sit this one out, as a people, we intend to LEAVE. Perhaps that action alone will ensure that other members begin listening to their electorate, especially if we begin a clear road to recovery. We are not your keepers but will gladly defend the ideology of democracy, but not as a member, as an independent country. Another great speech – one would wish to get an mp3 of the talks you mention later. On a sidenote, the funny and slightly bizarre thing in Germany is that a vast majority would support each and every drastical new step Merkel would go. It is downright bizarre, but whatever she proposes, plus the opposite – finds a magical 73% who think “she is great”. Sadly enough this does not change reality a bit. And it does not change how the mighty few plan to “sit this out”. But she at least knew that whatever she changed – it would be seen as wise. Mum Merkel, so to speak, rules. Just as the (and her) stupid market-radical ideas of the last years were seen as ‘wise’ by the majority. Not that they read about the background – “Mum Merkel said so. That’s sufficient”. One wonders if the voters were all asleep, for hundred years. Just that the waking up could be a harsh one, as far as I understand? I feel that Tasos comment is very deep. I sometimes comment here and have never received an answer from you. I have no doubt you’re technically a very bright person. That in some ways you have devised a plan that could buy Europe some precious months. What Tasos undermines, and that I deeply feel, is that time will be bought for nothing. Because European Union, in the end, does not exist. There is no common will that would be able to muster the kind of massive European investment plan you are calling for. I am not convinced that Eurozone breakup would cost a lot for other countries. I can see that worldwide economic equilibrium would change, at some cost. But European countries would most probably be replaced on a path to growth. And I am afraid the more time you buy for Eurozone the costlier the breakup will be. Finally, as much I can appreciate provocative thoughts, I do not accept your rhetorical trick that the ones that dislike euro most must repair it. We (at least me) dislike euro because we understand it is the root of our problems – notably I think commercial imbalances cleared the path for financial hubris, not the other way around. So what you are basically saying is that only magic can save the euro : that people who don’t like it because they understand its impossibility would find a way to repair it. You probably write the most lucid papers that I read on EZ crisis. But your views seem to rely upon buying time first, then praying for magic (German becoming inflation lovers, neoliberal European bureaucracy becoming Rooseveltian investors, Greece living on European subsidies for ever). I do not see where your ideas point at in the long term and what I guess you have in mind feels highly unrealistic. In the short term you’re probably much more lucid and clever. I was lucky enough to be in your audience on Monday night. I think its fair to say that your performance and messages in person are even more impressive than on the written page. One point that arose and still puzzles me is this idea that Germany meanders along, half-heartedly, in the knowledge that she (as a creditor nation) retains some kind of ‘get out of jail card’ in her back pocket. As we all know, this option – like most options – is diminishing in value over time, not least because with every month that passes Germany is sinking more and more real taxpayer money into the venture. So, by corallary, are you suggesting that Hollande et al are simply playing for time in an effort to drag Merkel deeper into the mire from which there is no escape? This may all work well as a political game but as other commentators note below, it takes the elite further and further away from their electorates. And thus the European ideal (whatever this means nowadays), as a project supported by the electorates becomes a bad joke. I fear that the only humane solution is for Greece and others to go their own ways now, before things take a turn for the worse. In short, I find it impossible to subscribe to your view that staying together is anything other than a utopian dream – and a dangerous one at that. Draghi, the Goldman Sachs alumni, is in Germany extremely despised for his extremely dangerous deeds. Since it is since long quite obvious that whatever he does is done mainly to support the finance industry everywhere, may it cost the taxpayers whatever it wants. Let´s hope the angry mob chases him out of the ECB like they did with the Stasi in Eastern Germany. They should put the ECB and EU people to jail! Can we expect Europeans to solve the problem of Greece and therefore of the euro currency? Yesterday I was spending the time reading about the 1953 London Debt Agreement, when I realized that the terms of the financial help towards Germany in the post-WWII world have been quite different than the ones posed to Greece in the post-2008 world. In both cases reconstruction is the operative word, the main difference is that the allies and by that I mean mainly USA understood the criticality of the moment, giving humongous amounts to Germany not as a loan but rather as a gift. Germany gave only up to 5% to pay back the original debt and was forced to balance import/exports. My point is that it seems that Eurozone (Germany and probably France, Britain) is not bold enough to think like USA did in the 50’s, maybe partly because now Europe is called to help someone (or many) of its own people and more importantly with its own reserves (?). EU partners seem reluctant to help since they cannot access still the impact in their national economies. It seems that it is common belief in EU that the Euro will exist in few years no matter what. I just heard the news that WMF is trying to have in the future a minor role to the Greek debt issue and the new loan agreement. I am not sure this time that they (WMF) have a problem resolving the Greek matter or they came to understanding that there is no point in saving Greece from leaving the Eurozone if there is a higher probability that Eurozone will cease to exist in the long term. The Marshall plan was implemented because the allies did not want to see Germany for third time to create a WW 50 yrs down the line but it seems that over-helping really exists as a term. Germany once greatly benefitted from a recovered strong industry in the 50-60’s creates again, this time by being in denial, a European chaos. The are refusing that the recipe is wrong when it comes to the Greek debt issue. Do you think that outside pressure (from US) could help bring the Eu back to a more realistic track?? I am not sure that there is a motive this time for the states to be highly involved in the EU insolvency problem.. I cant tell for sure whether they feel like they have a motive,but i can tell you that they are stupid if the dont.For if Europe goes down, everybody else will follow. Under the Marshall Plan, Greece got more support per capita than Germany. Now, what do make out of this fact? Not only would this proposal have brought substantial cash into Greece’s accounts. Above all, it was tied to a commitment to invest a FRESH 20 BEUR in Greece! 20 BEUR would be equivalent to about 7% of Greece’s GDP, I believe. My memory tells me that the total direct value of the Marshall Plan for Germany over 4 years was 4% of GDP. I suspect there will immediately be an uproar about selling state assets. Well, I recently learned about the Port of Piraeus where the state sold half to the Chinese company Cosco. I hasten to add that my information is based on the below NYT article (and a couple of other articles) and that I am not familiar with the details. This almost sounds like a miracle story: Cosco has tripled business volume in the first couple of years AND they will make 388 MUSD new investments! Given that half of the port is now owned by Cosco while the other half is still in Greek hands, you almost have a text book case for comparing two different alternatives. It is very difficult for a foreigner to understand why Greece does so little to attract foreign investment. If anything, Greece scares it away. The Marshall Plan was foreign investment (Americans invested all over Germany; and – believe this! – they financed much of that with German money!). The governor of Austria’s Central Bank who is probably one of the most moderate members of the ECB board who weighs carefully every word he says and who makes sure that he never says anything antagonistic was asked about Greece in a TV-interview some time ago. His answer: “It is very difficult to help someone who does not want to help himself”. Steve Jobs rejected his doctors’ advice for a traditional operation after he was diagnosed with cancer. He believed in homeopathic treatment. According to his biography, he accepted full responsibility for this and never blamed his doctors for it. You should know better than to try to mak cheap points, especially if you fail, as in this case. Since, as you have apparently missed, actually it was @meg who brought WW II and the Marshall Plan to this discussion. I just replied to her/his comment. Anyway, under the Marshall Plan, Greece got more support per capita than Germany. Now, what do make out of this fact? Pls. try to stay onb topic this time. You can’t be serious Very Serious Sam! You are the one who tried his hand at a cheap shot and… failed. First, as I already indicated, the German occupation caused Greece to lose, between 1941 and 1950 (through death, attrition and migration), 30% of its population. So, the Marshall aid it received after the war seems, naturally, large on a per capita basis. But only peanuts compared to what Germany received in dollars and cents. Secondly, and crucially, the Marshall Plan’s huge benefits for Germany cannot be understood independently of the massive debt forgiveness that came along with it in 1953. Without the latter, Germany would have remained a wasted land. Precisely as Greece is now. So, dear VSS: You erred spectacularly when you chose to ignore Basil Faulty’s wise recommendation “Do not mention the war!” Germany and Greece were not just two recipients of Marshall Plan aid. Greece was the innocent and heroic victim of a Germany that will remain in the annals of history as the ugliest, most horrific force of evil to have strutted around planet Earth. Your comparison brings a certain to nausea to the stomach of decent people. Quit now! @Yanis, please, mind causality. “…when I realized that the terms of the financial help towards Germany in the post-WWII world have been quite different than the ones posed to Greece in the post-2008 world…” was written by meg, NOT BY ME. I replied to this post. So why don’t you attack meg for her/his initial mentioning of the war? Why me, who just responded? @ Yanis, I’ve read this again, and I understand even less what’s going on here. Meg (again: NOT ME) brought WW II and the Marshall Plan to the discussion. I just replied to this post. With a statement of a fact. And a question. Got no answer, but an aggressive attack from you. No, two aggressive attacks from you. This historical events are apparently, and rightfully so, a very sensitive issue for you and other Greeks. But so they are for Germans! We are burdened forever with the guilt for the deeeds our ancestors committed. And belive me or not, but I do never forget what cruelty started out of Germany, by an Austrian, before I was born. And if I can I will fight against neo fascists. Ah, BTW, there are 0 (zero) neo fascists in any German government, regional or national. Now about the Greek New Dawn… No, forget it. In that case, we will stand together against the nazis everywhere. CDU/CSU and FDP have enough nationalistic and fascistic elements in their rows! Otherwise this kind of arrogant and inhumane behaviour inside the EU wouldn’t be possible! Beside that have you forgotten about all the funny “mistakes” of the German inland secret service the Verfassungsschutz and how this led to the killing of 10 foreigners by the Nazi NSU group??? Or what about the Neo-fascist Bildzeitung which is playing pro-Israel just to avoid beeing seen as a Neo-nazi media organization? Last but not least what about all the German Nazi war criminals of the Waffen-SS and other Reichwehr gorups like the Gebirgsjäger who committed unbelievable war crimes allover Europe and still are protected by the GERMAN STATE against foreign prosecution and who get full pensions paid by this allegedly Nazi-free new Germany??? Supporting the Euro is going to lead to the loss of ports, islands and the asset stripping of Greece I know you have bailed to the US but spare a thought for those back home. he above are Real Effective Exchange Rates with 35 industrial countries (outside the Euro) from the Ameco database, calculated based on ULCs (2000 is the base year). It is clear that most of the periphery, with the exception of Italy, will have returned to 2000 levels by the end of 2013. Compared to 2010, the change is rather impressive for certain countries. As a result, even an appreciation of the Euro will not be catastrophic as long as world demand increases by a healthy amount. On the other hand, Germany will only be able to maintain its current REER. This twisted geoeconomics imposed on Europe by Germany is in fact disguised geopolitics. Countries with different geopolitical goals, sometimes opposing each other cannot be under the same currency. It would have been different if EUROPE was more democratic, and all the institutions and policies needed were in place. THEY ARE NOT. 1) Turkish PM, from a country outside the Eurozone and EU and having constantly unsolved problems with almost every neighbor from the European side (Greece, Cyprus, Bulgaria, Romania), dared to say( the comment was made in Berlin, in front of Merkel) that IT WAS A MISTAKE TO ACCEPT CYPRUS IN THE EU WITHOUT SOLVING THE PROBLEM OF THE DIVISION OF THE COUNTRY ( THE TURKISH OCCUPATION OF THE COUNTRY). NO COMMENT FROM MERKEL. Or she said something about the weather. A EZ country’s very existence in it can be put in question in front of those who want to lead Europe (and want to impose austerity which will cut army spending and leave the country defenceless, all because of the same reason, the common currency), by the aggressor? 2) The Irish PM (today in Berlin too) was congratulated for the good work done in his country during the austerity program. After that Merkel said: “NO COUNTRY WITH A DEBT RATE OF 80 – 90% OF GDP CAN CONSIDER ITSELF INDEPENDENT”!!! These are only “small” geopolitical problems. Let’s not go deeper into the core. I think it is strategic mistake for Greece not to embrace the IMF position at this point and make a full meal of the fact that the German plan is inadequate as well as that the only true motivation for the Germans is to kill off time. A Grexit 3 years ago would have been unthinkable, a Grexit today remains unpleasant but a Grexit in 2 years from now would be thoroughly manageable. So, what are we (Greeks) think by becoming spectators in the behind closed doors disagreement between the IMF and the Euro Commission and ECB? How many chances like this we will ever get? Why are we so lethargic in seizing the moment? Hello!!!! The light is on but nobody home! 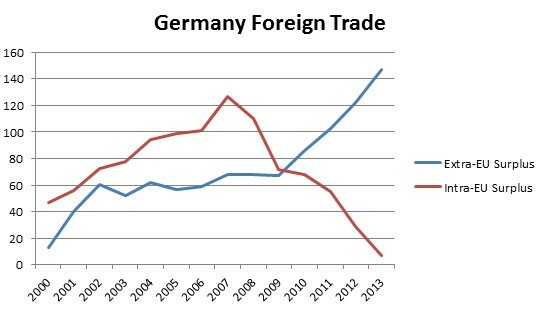 Here in Germany, the argument is often made that Germany leaving the Eurozone and returning to the DeutschMark would lead to exports from Germany stalling, as the new DeutschMark would be too strong. What I don’t understand: The German central bank could always print more DeutschMark and donate them to the government for discretionary spending, thereby devaluing the Deutschmark whenever it becomes too strong. Why is this not done in countries such as Switzerland and Japan, where exchange rates are so high they are hurting the exporting industries? Any thoughts? You have to be kidding if you believe that the Germans would ever decide to print money.Weimar is hardcoded in their brains, they are too scared of inflation even though they dont understand what caused the Weimar hyperinflation and why it doesnt apply to today’s Germany even if it printed some money. As for your question.Apart from the fact that devaluing would harm the image of a big economy like that of Japan, nobody guarantees you that others wont follow after that,effectively reducing the devaluation’s results.Still Switzerland is currently buying up FX Reserves which can be explained as an attempt to prop these currencies up vis-a-vis the franc. A strong cuzrrency only hurts the industry for a short time. Industry adapts. Look at how well the population in countries with strong currencies is doing. To print money solves nothing. Την ίδια στιγμή που η γερμανίδα καγκελάριος Άγκελα Μέρκελ μιλούσε για περιοσρισμό της ανεξαρτησίας των χωρών που το χρέος τους φτάνει ή ξεπερνάει το 80 με 90% του ΑΕΠ, φαίνεται ότι ξέχασε –ή έκανε ότι ξέχασε– το γεγονός ότι το επίσημο δημόσιο χρέος της Γερμανίας φτάνει σήμερα τα 2 τρισ. ευρώ (75% του ΑΕΠ). Κι όλα αυτά, ενώ πριν από λίγο καιρό ο Γερμανός καθηγητής Οικονομικών του πανεπιστημίου του Φράιμπουργκ Μπερντ Ράφελχιουσεν αποκάλυπτε στη «Handelsblatt» ότι η Γερμανία «κρύβει» χρέος συνολικού ύψους 5 τρισ. ευρώ (! ), το οποίο έχει συσσωρευτεί λόγω των ελλειμμάτων στο σύστημα κοινωνικής ασφάλισης και στα συνταξιοδοτικά ταμεία! Ποσό που αντιστοιχεί, αν ισχύουν οι ισχυρισμοί του Γερμανού καθηγητή, στο… 260% του ΑΕΠ της χώρας! WAKE UP GUYS THIS IS A WELL ORCHESTRATED TAKEOVER OF GREECE AND OF THE OTHER WEAKER EUROZONE COUNTRIES BY NEO-NATIONALISTIC GERMAN ELITES AND THEIR ALLIES!!! And yes the European Economic Union was Nazi Germany’s Plan B after their defeat in WW2. They even published books about their economic plans!